On Saturday of this week, right before leaving for two and a half weeks of travel, I played a game of “how do I use up my produce in a 48 hour period?” I play this game often before I go on a trip, because in general I’m more likely to have a full fridge at any given moment than a threadbare one. I had kale, peppers, eggplant, cucumbers, a zucchini, some strawberries, almond milk, and an apple. I froze the kale, and I knew the peppers, cucumber, zucchini, and apple would make it to NYC if I toted them along with me. The strawberries went into yesterday’s vegan, gluten free strawberry pumpkin pancakes. 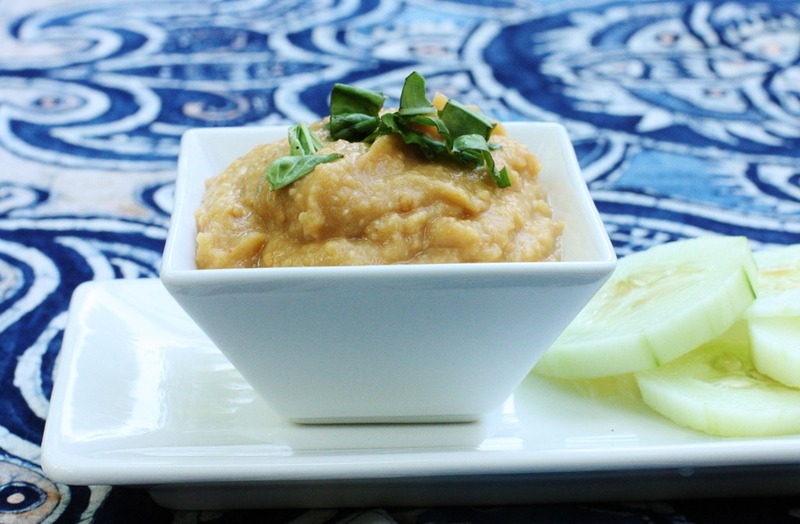 The eggplant would have traveled nicely, too, but since I had a full pantry of legumes and spices, I decided to create a lovechild between babaganoush and red lentil dip. And it was every bit as tasty as I’d hoped. You’re probably getting a little bored of my fondness of smoked paprika, but please don’t. The stuff is really so good it’s worth using, and using often. If you can’t grill at home, or if you’re not in the mood to grill or broil (it’s still about 97 degrees in the shade in D.C., so consider me not in the mood to stand over a grill), smoked paprika can help to create a smoky flavor without grill marks. 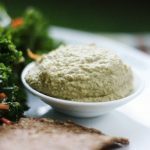 In this recipe, I used it and I used nutritional yeast (also an ingredient I abuse, but the results are always so good it’s hard not to) to create a salty, smoky flavor. 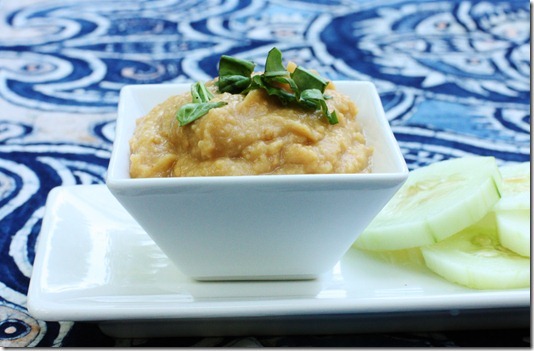 Red lentils are one of my favorite legumes because they’re so thoroughly low maintenance. Thirty minutes on the stove is about all it takes, and you can shorten that by soaking them first. They’re good sources of folate, iron, protein, and vitamin B1, and they’ve got a soft, versatile texture. The lentils I used this time were part of a wonderful group of legumes I’ve been given to sample by PNW Co-op Specialty Foods. More on those soon! 1. Preheat oven to 400 degrees. Prick the eggplant with a fork, then lay it on a foil lined baking sheet. Bake until it’s collapsing (about 30-45 minutes, depending on your eggplant). Let it sit for a little while, to cool. 2. While eggplant is cooking, bring water and lentils to a boil. Turn heat to a simmer and let lentils cook with a lid ajar. When the lentils are tender, they’re finished. It should take 30 minutes or so. 3. Drain lentils and add to a food processor. Cut eggplant in half and scoop out flesh, and add it, too. Add all remaining ingredients and process till mixture is smooth but retains some texture. Serve with crackers, veggies, or even as a thick dressing! On Friday, when I was showing some of my packed lunches and breakfasts on the blog, Hannah asked how I make time to whip up so many dips and spreads with my schedule. The answer is that you can get a long way with a half hour in front of the food processor! I set aside thirty minutes to make hummus and at least one other sort of dip every weekend. 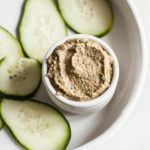 I do sometimes used canned legumes to make it all go faster, but it’s amazing how that little investment of time can give me dips and spreads to carry through the busy week and weekend. On that note, I’m off for tonight. New York is calling! See you all tomorrow. 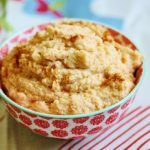 Smoky Cauliflower and White Bean Dip: Creamy and Delicious! 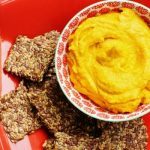 I have been using red lentils for my hummus base lately. I find it makes the dish creamier and they really are low maintenance! This dip looks and sounds amazing. I also abuse nutritional yeast. I honestly put it on everything expect porridge in the morning. Smoked paprika! It really is one of my very favorite spices in the fridge. I’m southern, so it’s been a trick to figure out how to give things like greens and peas a smoky flavor without a big hunk of meat. Combinations of smoked paprika and liquid smoke generally do the trick! Smoked paprika sneaks its way into many of my dishes as well. It’s such a great way to bring the flavor up a notch. This is yet another recipe of yours to add to my “to make” list. Thanks! And have fun in NYC. What a great city to have as a home base. yum! i love red lentils and eggplant. i know everyone hates substitution questions but i’m wondering if you’d think lemon juice would sub for the ACV both in this recipe (which I’m guessing it would) and the waffles? no vinegar allowed for me right now. It’s not possible to use smoked paprika too much, or nooch for that matter! Agreed. Not possible. No way, no how. Red lentils are amazing, I love how quickly they cook. Also, smoked paprika adds a depth of flavor, makes dishes interesting, kind of a southwest flair to it. That dip would be fabulous with just about anything – it looks so creamy and smooth and perfect! Eggplant is one vegetable that I fear! I have no idea what to do with it and my husband can’t stand it… this may change things drastically. Looks delicious, I LOVE smoked paprika! i love playing the “how do i deal with all this produce in my fridge” game before going away! i’m gearing up to do just that too – i’m nyc bound myself on saturday! Yum! This looks awesome. And great idea to freeze kale….I’ve never thought of that, and as a result, I’ve had to throw away some bunches in my day. (Blasphemy, I know!) Is there any special trick? Do you just stick it back in the fridge when you’re ready to eat? 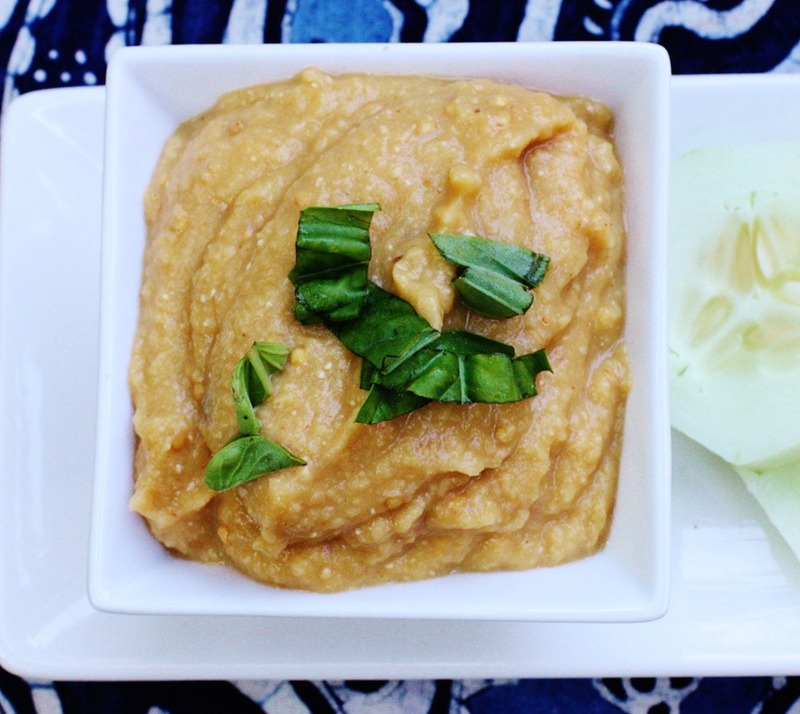 Oh yum, this makes me want to buy red lentils and eggplant right now! Very interesting combo. I, too, am a smoked paprika fanatic. My generously pouring it into every concoction has been the cause of more than one argument with my boyfriend! Keep the smokey recipes coming! I just made this, it was super easy and amazingly delicious. Such a great departure from hummus. haha i feel the same way about vietnamese cinnamon as you do about smoked paprika. once you try the stuff you will never go back to the boring general default version. Can you believe I’m 40 years old and have never had smoked paprika??? 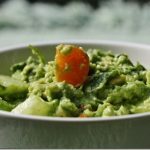 I see there are many fans of it here so will have to try this recipe at once and live a little! This dip looks amazing. I do make lentil spreads pretty often and this year I fell in love with a russian eggplant mush – so this one must be a total win. Plus I really had a laugh reading your first paragraph – “because in general I’m more likely to have a full fridge at any given moment than a threadbare one” – so totally me! I am such a buying in bulk and having a full fridge girl, that everytime a sudden short trip comes up, I’ll start to cook, bake and preserve as crazy and invite a lot of friends over for lunch and dinner. 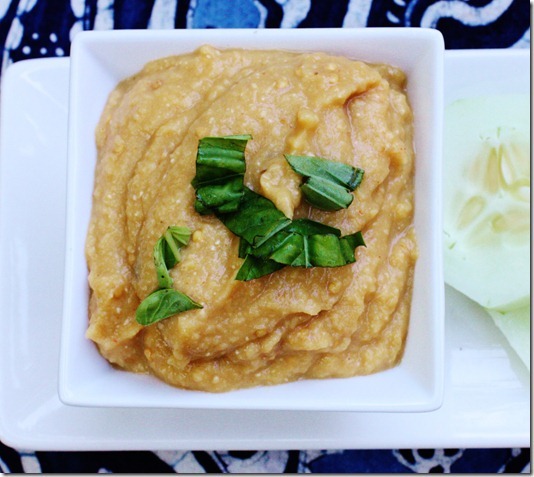 i love red lentil dip! yours sounds amazing. I am often playing the “how do i use my produce?” game. I get a share of a CSA and each week I immediately start planning out how to use, store, and preserve my produce in the right order so that not a leaf of lettuce goes bad. not always successful, but each week gives me another shot at it. Anything with eggplant is super awesome in my book! Made this and it was great. Used canned chickpeas instead of lentils and it still worked really well. It was so tasty I ate it straight up — no dippers needed!! 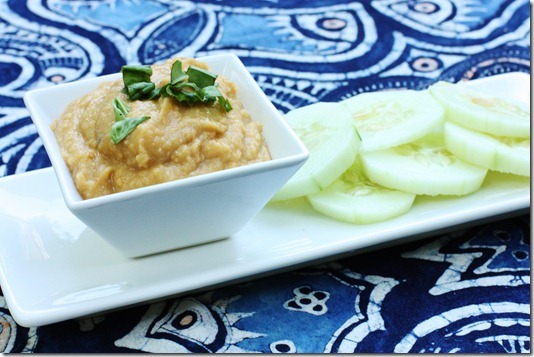 Just made this dip this evening – it turned out great! I like the cumin and smoked paprika together. Thanks for posting this. Just made this and it turned out amazingly well, so creamy and delicious. Super easy to make too. 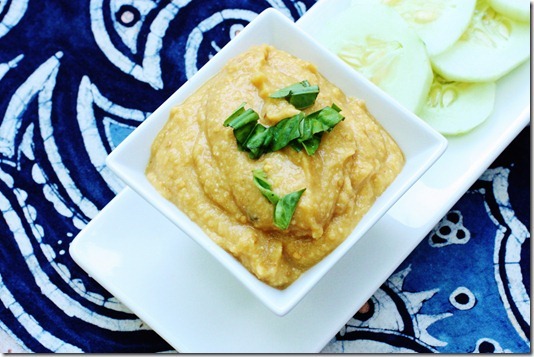 How long will this dip last in the refrigerator – can it be frozen?? About 5 days, and yes, it can be frozen for up to 6 weeks!